The jockey seat is a saddle shaped seat with a back rest. 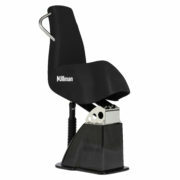 Inspired by horse back riding and motocross, the first jockey seat for boats was designed by Dr. Johan Ullman. The characteristic shape of the jockey seat changed the perception of what a suspension seat in high speed boats should look like and is now the standard in many of the sea rescue units, coast guards and navies around the world. 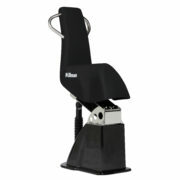 Known for inventions in the field of human factors, ergonomics and injury prevention, Dr. Ullman and the team at Ullman Dynamics continue to lead the development of the jockey seat. 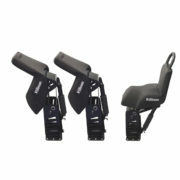 The straddling shape of the jockey seat allows for the seated to actively use the legs as a means to engage the body, which will act as a direct feedback system when exposed to whole body vibrations and slamming. The jockey seat has a superior capacity to protect the human body. Its excellent suspension and dampening, low weight and small footprint has great a advantage over conventional seats, which is key when operating high speed RIB boats.